You don't change the email as the keys are tied to them. You will, instead get a different key when your PayPal email changes. Then, use the "Link Keys" feature in the dashboard to hook the two together. Yeah I'm trying that, and it says link successful, however the plugin is still saying trial. 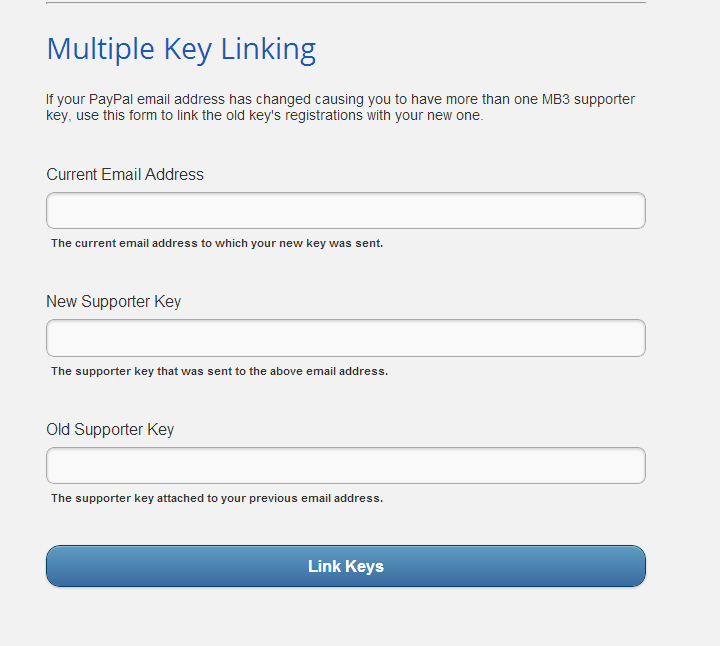 And after linking, if I then add the new supporter key to the MB3 Supporter Key (paste from email) field, then it says I'm not a supporter. Edited by DigiTM, 14 November 2013 - 06:15 PM. Okay, this should be working now. You attempted the linking a few times and one of the times you did it, you linked the same key to itself which threw us into an infinite loop. I need to trap that situation. So somehow I broke the system. Ooops....my bad. At least I showed you a way that someone could break it I guess. Appreciate the help EBR as always. All working now, thanks devs. I have just started doing a ton of bluray menu extractions for ones that didn't get picked up by the plugin, but would like to share. Edited by Luke, 15 November 2013 - 09:35 PM. sounds like a bug. i'm sure Radeon will take a look once he sees it. Just installed MBT and added this Movie Themes Plug-in. restarted the server (Version 3.0.5069.18843). and ran the scheduled task to get the intros. not sure if im doing something wrong. he probably doesn't have one yet in his database for any of your A's. I know that he is out for a few days and has a few hundred new movie themes to catalog once he gets back. Ahh, Ok. I figured it was grabbing them from somewhere online automatically. Didn't realize they had to be assigned manually. Could you give me a full debug log of this one please darengibo? (you'll need to enable debug logging under advanced on the mb dashboard, restart mbs then run the scheduled task again) Just upload your log to dropbox or something and pm me a link. I attempted to run it this morning and it appears to have self corrected.. currently at 88% (wouldn't go past 7% earlier). So crossing fingers.. if problem persists, I will post debug log. I registered the plugin and ran the schedules task. It's all working great. However, is there a reason the "backdrops" folder and it's contents are hidden in windows file explorer? to prevent other programs like sickbeard and metabrowser from getting confused by their presence. Ah, ok. I was just trying to see which ones had been processed successfully and wondered why there was nothing there. Thanks for the fast answer as usual!